I lived in Banská Bystrica for 12 years from 1994 to 2006 and since then I’ve been living in China. I’ve decided I want to introduce my Chinese girlfriend to the wonders of Slovak food and that’s how, today, I came across your fantastic site. I’m going to start easy tomorrow and cook some haruľa, then go buy some edam for vyprážaný syr the day after. However, my question for your is, did you ever eat a Zapekanka from the buffet under the archway on Národná Ulica? It’s been driving me crazy trying to remember how they made it, but to make matters worse, I had a very good friend who used to work there, who sadly I’ve lost touch with. Hopefully you can help jog my memory and I thank you regardless for your amazing efforts in putting all these recipes together.. I knew exactly which buffet Neil was talking about! Buffets like these are common throughout Slovakia. One of my favorites in Banská Bystrica (my hometown) is the one outside Starý Prior (meaning “Old Prior”, Prior is a communist-era department store, this one is still in existence). That buffet sells delicious fried dough langoše. But since it’s been few years since I’ve had zapekanka (roughly meaning something that is baked), I recruited a small army of friends and relatives in Slovakia to find the recipe. I’ve got a bunch of responses (thank you all!) but eventually settled on a recipe from mimibazar that my friend Janka sent in. 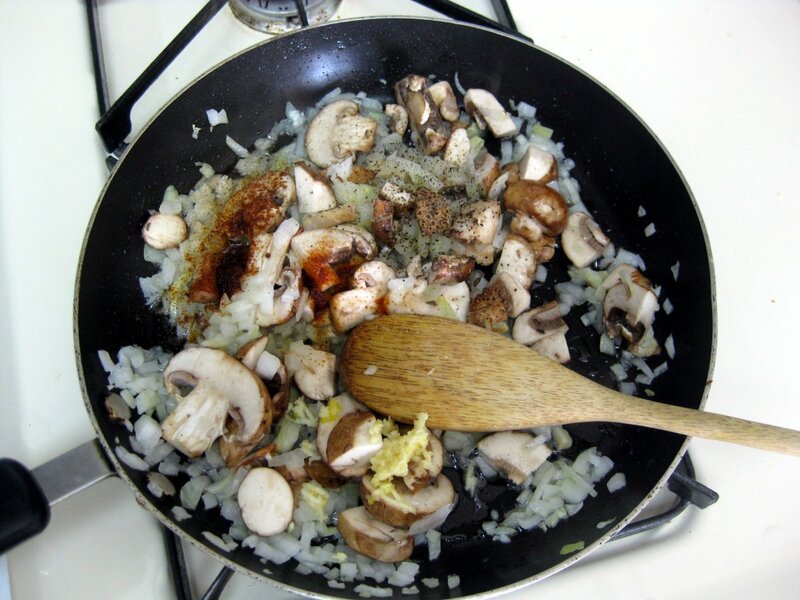 Another recipe, sent in by my sister, was similar but only had mushrooms – good choice if you are vegetarian. Peel and finely chop the onion (cibuľa). 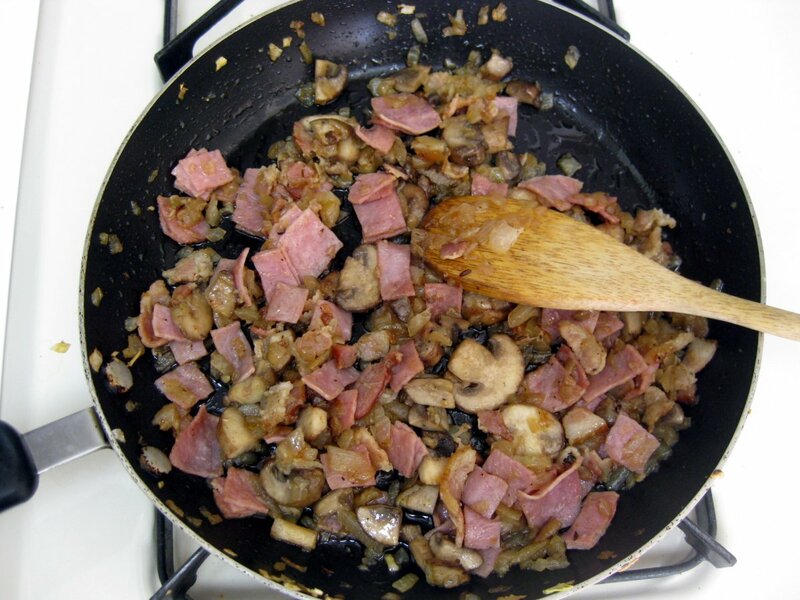 Fry it on oil along with bacon (slanina) till both start turning yellow. 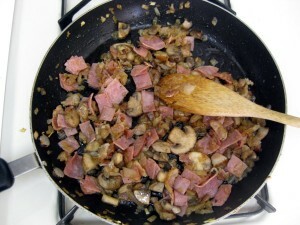 Then add sliced mushrooms (pokrájané hríby), ham (šunka) chunks, salt and pepper, and also a pinch of caraway and red pepper. Also add one clove of garlic (strúčik cesnaku), minced. Cover and let simmer until the mushrooms get soft. 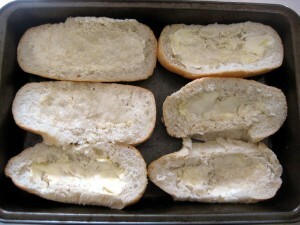 Slice the bread rolls, baguettes, or, even better, home-made rožky, in half and spread cream cheese (syrokrém) on them. Except I didn’t have any so I topped 4 with butter (maslo) and 2 with mayonnaise (majonéza). I also spread horseradish on one of them, just to experiment. Let the mushroom mixture cool off for few minutes and then spoon it onto the bread rolls. Cover each roll with slices of cheese (syr). I used Colby on 3, Edam on 2, and Brie on 1. 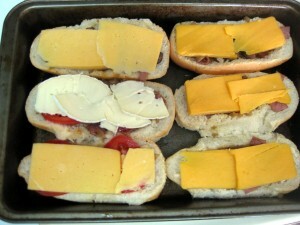 I also topped two rolls with sliced tomatoes (paradajky). I figured you can never go wrong with toasted tomatoes. 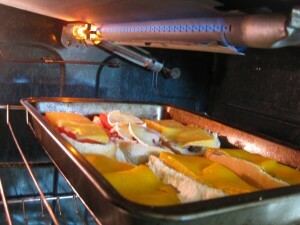 Then toast in the oven until the cheese melts. The recipe said to bake the rolls for 8 minutes, but I figured that broiler would work better, so that’s what I did. And that’s it, super simple! Top them with ketchup (or tartar sauce) before eating. Enjoy! My family doesn’t eat a lot of bread but thiss looks very delicious. I think they are good for parties. 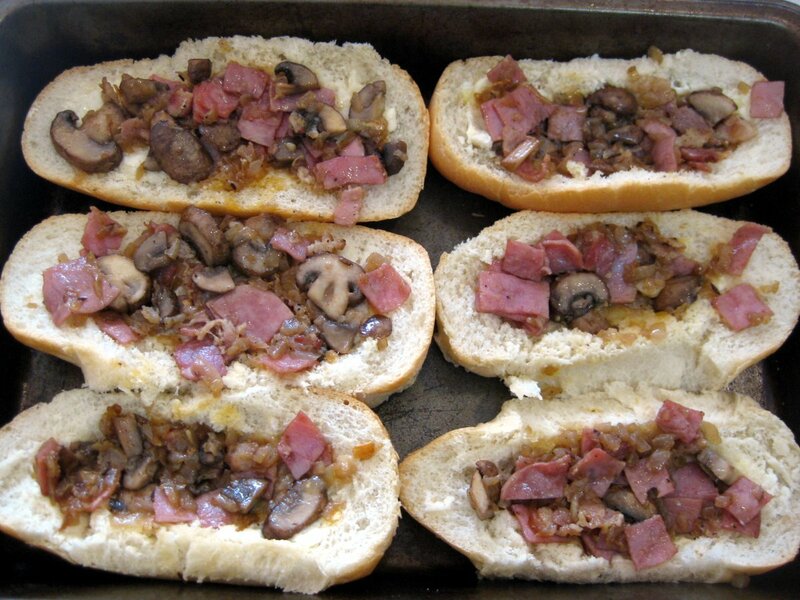 In Poland it’s called zapiekanka and we do not pre-cook the filling but grate mushrooms instead. Lubos, these things are, in the words of my eight year old, deeeeellliicious! Another winner! These pieces really set a stdarnad in the industry. This is funny, in post USSR countries, Zapekanka is not salty, but sweet. 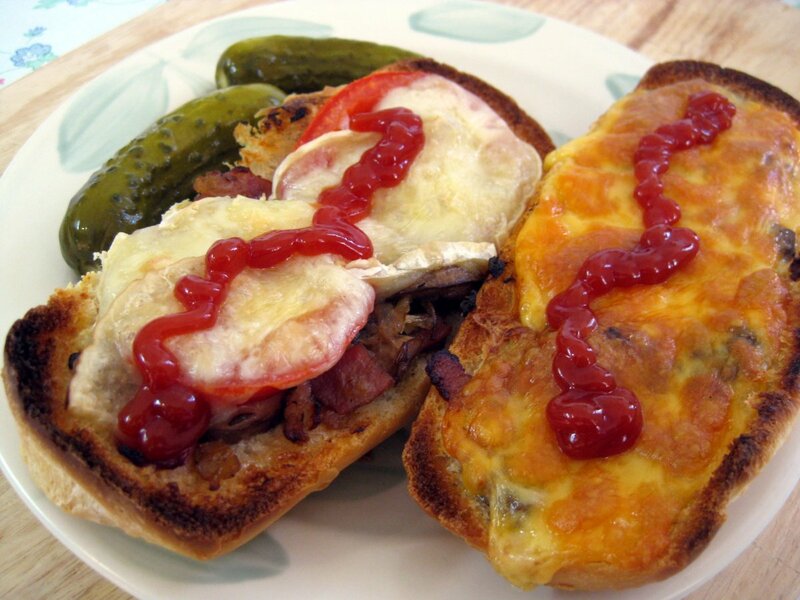 This is made with 200g tvaroh cheese, 2 eggs, 300g mucka, sugar, kisele mleko and raisins. This is delicious and very light. I will keep your recip in mind and serve it during parties. They look amazing. I can’t wait to cook them. I think they will be great for parties. These look awesome. 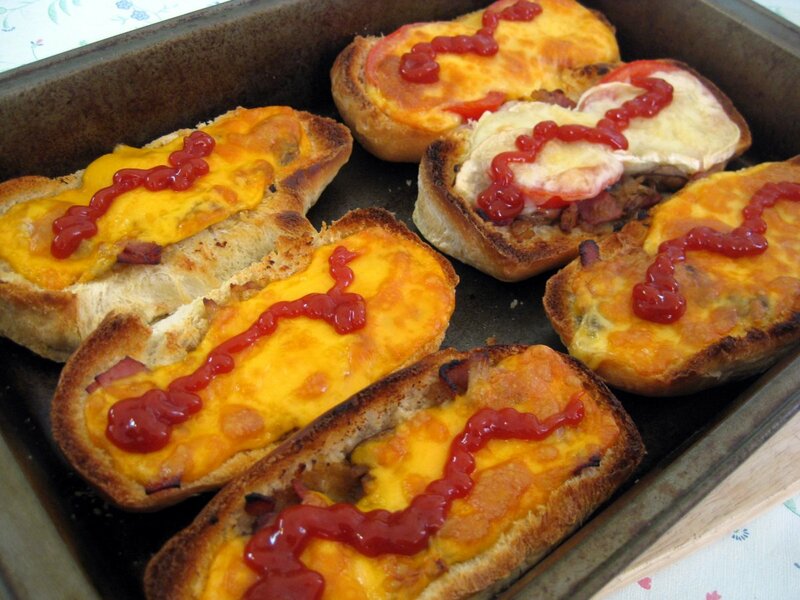 They combine some of my favourite ingredients and look so easy to make. I must have known I was finding this site today because I bought some bread rolls which I don’t normally do. I’ll give them a try.